Track One: The Journey of Recapitulation is used in conjunction with the Journey to Alcyone from the beginning of the rainbow body work in the Companion Guide. It is the tool that allows you to clear the entanglement with others that blocks your quest for autonomy and clarity. The remnants of such interactions are released with the thoughtful intent to free the other person as well in an act of healing. Track Two: The Journey to Change Thought Programs assists the disassembly of thought programs (in conjunction with the Journey to Alcyone and the Journey of Recapitulation) that can clutter the mind/soul and cause us to play the same old programs from the past without conscious awareness of them. Once we have the awareness, have changed the beliefs and recapitulated the memories that the programs were built upon, we can take this journey to let them go to the universe with love in our hearts. 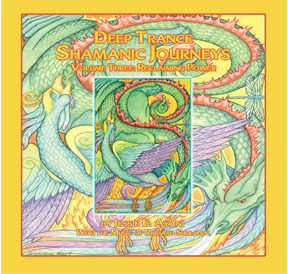 This journey is used later on in the rainbow body work. ISBN# 978-0-9648763-8-5, Total running time 72'. [mP3 options: CD Baby, itunes. mP3 customers can obtain the instructional text from this CD booklet here.